The staff of Kotaku nominated nine games for 2012 Game of the Year. One game, XCOM: Enemy Unknown, blew the competition away. The PC and console turn-based strategy game from the masterminds behind Civilization was a dark horse in our staff voting. Last week, as we publicized our nominations, two other games—the dramatic five-part adventure game, The Walking Dead and the moving, quiet multiplayer PlayStation 3 hike Journey—had attracted more attention. Both have won numerous Game of the Year awards from other awards-givers. Our nominees in 2012 were a diverse bunch. The big budget first-person shooter open-jungle adventure Far Cry 3 turned heads. Smaller, more obscure games like the locked-room interactive-novel Zero Escape: Virtue's Last Reward, the brutal Indiana Jones-esque platformer/roguelike Spelunky, the mesmerizing puzzle "geometric rhythm seizure survival" game Super Hexagon, the complex 400-year dynasty-simulator Crusader Kings II and the autobiographical, wrenching Papo & Yo all drew some votes. But the winner was XCOM: Enemy Unknown, a game for the strategic-minded among us, a game that updates a classic and once again presents a worldwide battle of humans against alien invaders as a terrific variation of violent chess. The game is deep but intuitive. It rewards planning and focus, it penalizes failure. It requires patience but can still be exciting. It's an easy game to start playing and a tough one to stop. Plus, that music when you're going into battle, always gets us pumped. 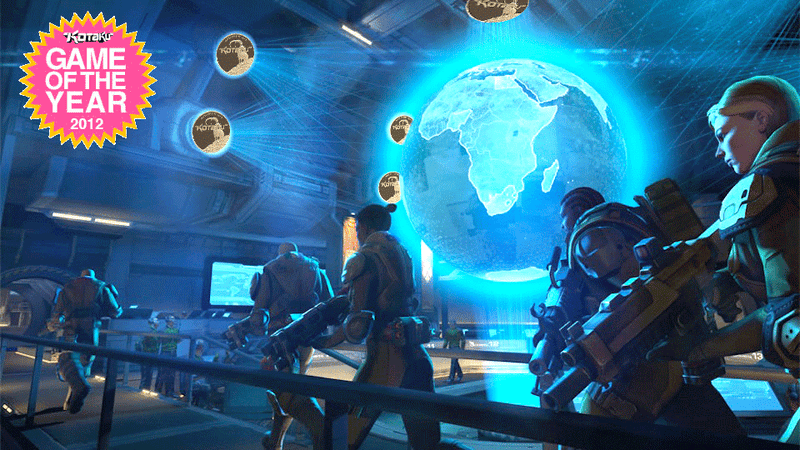 We salute XCOM's developers, Firaxis studios. We still recommend that players invest in plasma weapons. And we look forward to a 2013 full of great video games.